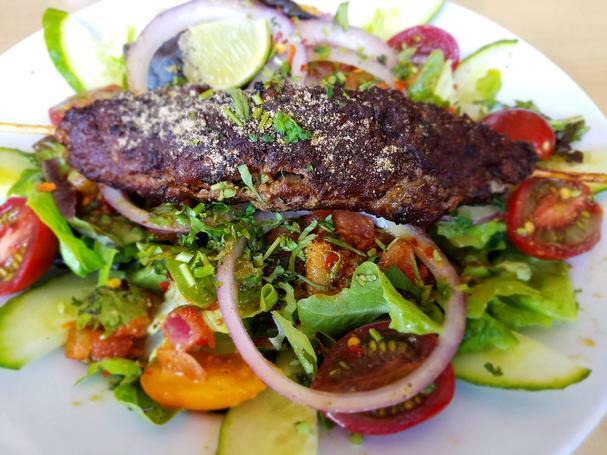 Some refer to Kachumber - a salad of tomatoes, onion, and cucumber - as the Pico de Gallo of Indian food, and indeed, it is often simply served as an accompaniment to dishes. 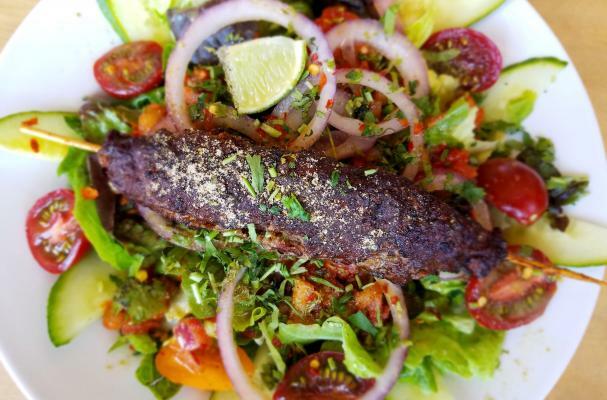 But this delicious marinated salad deserves center stage, especially when using summer's ripest tomatoes and topped with a spicy lamb kebab. Multi-colored cherry tomatoes make the most striking presentation in this dish and generally pack in a sweeter punch than larger varieties in early summer. Their sweetness, along with cooling cucumbers, pair beautifully with aromatic spices such as cumin, chile, and masala. For a vegetarian version season tofu or chickpeas with the same lamb seasonings, then grill or roast until crispy. Slice vegetables and chilies and chop herbs (reserving 1 tablespoon of the mint for the lamb kebabs), then place them in a medium-size bowl. Add the lime zest and juice and toss. In a small frying pan, add the dry spices and heat until aromatic. Add to the salad and stir until well combined. Season to taste with salt and freshly ground pepper. If necessary, add more lime juice (you want it nice and zesty). Refrigerate until ready to serve, stirring ever so often to redistribute the juices. Meanwhile, make the lamb kebabs. Add lamb and remaining ingredients to a mixing bowl and, with clean hands, gently mix until well combined. Divide meat into two equal portions and press onto bamboo skewers (or form into balls). Place on a preheated griddle or barbecue grill and cook for about 3-4 on each side or until nicely browned. Give the salad one more toss. Place a handful or two of baby greens onto two plates. Top each with the kachumber salad and a lamb kebab. Garnish with lime wedges and serve.